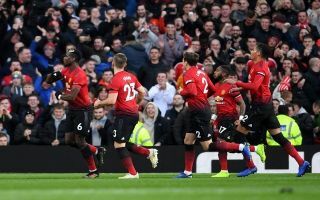 After Paul Pogba tucked away the rebound after he missed a penalty for United today, the midfielder became United’s top scorer this season with a tally of 5 goals. Pogba is now United’s leading scorer across all competitions which is a particularly worrying stat for United fans and is a telling reflection of just how bad the Red Devils start to the season has been. Paul Pogba now Man Utd top scorer with 5. Jose Mourinho’s decision to axe misfiring striker Romelu Lukaku looks to have paid off so far with United looking a lot better going forward than in previous games. Lukaku will be scratching his head to find a way to fire himself back to the top of United’s scoring charts and a striker of his calibre and reputation shouldn’t be struggling to hit the back of the net regardless of how poor the team have been performing. The above stat courtesy of Squawka also highlights that despite Paul Pogba’s strenuous relationship with manager Jose Mourinho off the pitch the Frenchman is very much the focal point of this United side. For those of you who aren’t fans of the Premier League be sure to follow live action of AC Milan’s match against Sampdoria with Gennaro Gattuso’s men looking to bounce back from two consecutive defeats. Click here to see how you can follow the coverage online and on TV.